We are pleased to announce the launch of our new racing club, with Bad Bad Leroy Brown as our first club horse. 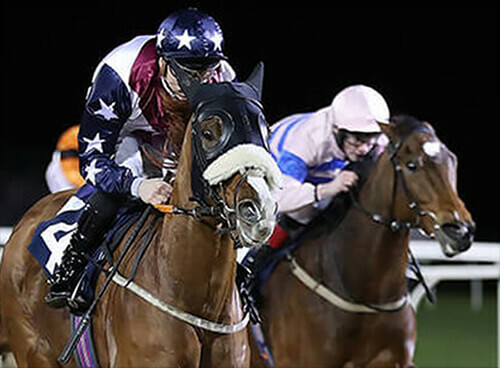 With a 1/10th share costing only £150 per month (and there are no hidden extras) the racing club offers a great way of becoming involved in national hunt racing ownership. Having previously won a Point to Point and been 3rd in a bumper at Bangor, he finished 5th but only beaten 15 lengths at Sedgefield on his seasonal reappearance on 22nd November. He is now all set and ready to run over hurdles in the next 2-3 weeks. Being a second season horse we hope that he will run every 3 to 4 weeks through the season so should therefore offer club members great value for money. The £150 per month covers all costs up until 31/5/2017 when we will decide on whether to continue with this horse or introduce a new one into the club.